Uncertified student loans are the financial aid programs that are not certified by an educational institute. These funds are granted by the private student loan lenders. The rate of interest of uncertified private student loans is higher compared to the interest rate of certified student loans. Students not schools are given the loan amount directly in these types of loan programs. Non certified student loans are given on the basis of financial need but requires credit check. Students who want financial aid of this kind can get in touch with private lenders such as banks and evaluate their options. Why Apply for Non Certified Student Loan? Since college programs have become very costly, it is very hard for most students to pay for the tuition and other expenses out of their pocket. This is why they look for different financial aid programs. Although the rate of interest of federal students loans is very low but these funds do not cover complete cost of education. With the help of uncertified student loans students can get money for the expenses that are not covered by federal aid. The ones who exhaust their federal financial aid options can apply for these funds and get money for tuition, fee, books, housing and other related expenses. How to Apply For Uncertified Student Loans? Students should research well and explore all their options to find the best loan program. They should find out different loan programs that are offered by private lenders and compare them. This way they will be able to come across the best option in terms of rates, loan amount and repayment plans. Q:What are the consequences of not paying non-certified student loans? A:Students can face a number of dire consequences when unable to pay off their non-certified student loans. Some of the consequences as a result of non payments are interception of federal income tax refunds, increase in payoff payments, outstanding amount turned over to collection agencies and legal proceedings initiated against the borrower. To avoid these circumstances, students are requested to use up their federal loan options first before applying for non-certified loans. Q:I do not wish to go for a non certified private student loan but worry that interest rates of Stafford Loans may be too high. Can you please brief me in this regard? A:It is understood why you do not want to opt for the Non Certified Private Student Loan programs. It should also be noted here that Stafford Loans are one of the cheapest loans you can get in the United States. At the moment, the interest rate for subsidized loans is 3.40% and is 6.80% for the unsubsidized ones. This is significantly lower than most of the other federal loans. Q:While reading on the non-certified private student loan plans, there was mention of the course on Financial Institutions and Markets. What are the contents of this course? A:It is common to get to read about the course on Financial Institutions and Markets while going through the Non-Certified Private Student Loan plans. This course is worth 3 credits in total and is designed to provide students with ample understanding of the different types of industries of finance and how the organizations within that industry work in the most optimum of manners. Q:As I read on non-certified private student loans, there was mention of the course on Introduction to Computers. What are the contents of this course? A:It is quite common to get to read about the course on Introduction to Computers while going through the Non-Certified Private Student Loans. This course is worth 2 credits in total. It is designed to provide students with ample understanding of the fundamental level concepts of computer hardware as well as software and the terminologies that relate to it. Q:What are non-school certified student loans? A:Non-School Certified Student Loans are loans not offered by the institute itself or via the government. These are most commonly referred to as private student loans which the student arranges for on their own via banks or any other financial intermediary. Private loans are not the responsibility of the institute. Q:As I went through the uncertified student loans 2012 plans, there was mention of the course on Leadership & Motivation. What are the contents of this course? A:It is common to get to read about the course on Leadership & Motivation while going through the Uncertified Student Loans 2012 plans. This course usually is worth 2 credits in total. It is structured to provide students with ample levels of understanding of the various qualities needed to realize the leadership potential in an individual. Students are provided with hands on experience. Q:Should I steer clear of non certified loans? A:It is recommended that stay away from non certified loans. These loans are not certified by any government and educational body. Students are advised to apply for federal loans first before going for private loans. In case of private loans it is recommended that students ask for the preferred lenders list. This list provides information of all the lenders that are certified by the institution and have received excellent ratings from previous applicants. Q:As I read about the non school certified student loan plans, there was mention of the course on English Composition. What are the contents of this course? A:It is quite common to get to read about the course on English Composition while going though the Non School Certified Student Loan plans. This course is worth 2 credits in total. It is designed to provide students with ample understanding of the basics of writing in English and the concepts of paragraph development. Students are also provided with ample hands on experience. Q:When I went through the private student loans uncertified plans, there was mention of the course on Money & Banking. What are the contents of this course? A:It is common to get to read about the course on Money & Banking while going through the Private Student Loans Uncertified plans. This course usually is worth 2 credits in total and is designed to provide students with ample understanding of the study of monetary economics and the concept of international slant. Students are also highlighted on the management of financial institution. Q:My search for private student loans non certified mentioned Bachelors of History. What courses would I be required to attempt? A:Searching for private student loans non certified would mention Bachelors of History. In this program, students will be required to attempt courses on world civilizations, Civil Rights Movement, History of American Business, U.S. military history, American Revolution, Industrial revolution, scientific revolution and U.S. Civil War. Mentioned are just some of the courses included in this program. Prospective students interested are advised to search our website for more information. Q:How can I avoid non certified private student loan lenders? A:There are a number of ways in which non certified private student loan lenders can be avoided. It is recommended that students have a prior COA (Cost of Attendance) estimate before applying for financial aid. This will allow them to apply for the required amount of funds. Federal aid is an excellent option for students as they offer grants, scholarships and loans that are solely based on the student's financial need as opposed to credit in case of alternative loans. And students should also make use of the preferred lenders list provided by institutions in order to avoid non certified loans. Q:Is there any drawback of taking a non certified private loan? A:Not exactly. However, withdrawing a loan with the reference of the institute is always beneficial since that helps the applicant in application process as Non Certified Private Loans do not offer that. Moreover, students can get better deals with the involvement of the institute which is not the case with a non certified private loan. Q:What is a private non certified student loan? A:A Private Non Certified Student Loan is a loan withdrawn from a private lender without the interference or the knowledge of the institute. Students take out these loans on their own and it is solely their responsibility to manage the schedule. The institute has no say in these loans. Mostly students take out non certified student loans since a majority of institutes do not offer private student loan lending options or guidance. Q:What are not school certified student loans? A:Not School Certified Student Loans are loans which students have withdrawn on their own without the consent of the school. These are alternate loans which students can get from banks, or any other financial intermediary in the economic system. Students borrow directly from the lender and the school plays no part in the process. Schools are in fact mostly unaware of these loans withdrawn by students. Q:Where can I find uncertified school loans? A:Uncertified School Loans can be found easily by browsing through our website. We have a list of these loans with details on their lending procedures. Uncertified loans not sent directly to the students and are not backed by any institution. They are generally considered to be have a higher interest rate. Q:What are uncertified private school loans? A:Uncertified Private School Loans are student loans offered to students directly - without involving the school. In case of uncertified private student loans, schools are mostly not aware that the student has taken out a loan. The loan is the responsibility of the student and has to be paid back by the student only. Q:What are the main advantages of taking non certified loans for students? A:Non certified loans are those student loans that can be acquired by private lenders and are not certified by the federal government or schools financial aid office. This contract is strictly between the student and the lending firm. The main advantages of non certified loans for students are: no authorization needed form your school, the loan limit is greater than other types of loans, the full amount of the loan can be obtained altogether, and the loan can be used to cover additional education expenses. Q:While reading about non certified private loans, I came across a course on career and professional development. What is the premise of this course? A:Course on career and professional development would be mentioned when searching for non certified private loans. This course is worth 3 credits and deals with a wide variety of careers. With the help of this course, students learn about organizational entry, orientation, preparation, assessment of interests and personal development plan. Prospective students interested in this course are advised to search our website for a comprehensive list of institutions offering this course. Q:As I read about the non certified student loans lender, there was mention of the course on College Algebra. What are the contents of this course? A:It is common to get to read about the course on College Algebra while going through the Non Certified Student Loans Lender.This course is worth 2 credits in total. It is designed to provide students with ample understanding of the basic level concepts like numbers and sets. Students are also highlighted on the concepts of algebraic application in computers. Q:Will my credit score be affected if I file for bankruptcy for not being able to pay off my student loan uncertified? A:Yes, your credit score will be greatly affected if you file for bankruptcy. This is specially the case when it comes to private loans and uncertified loans. Your credit score will have a huge negative impact. It will demolish your credit history and you will be unable to apply for any sort of private student loan in the future. Yu will not be considered as creditworthy in the market. Q:I have used up all mu previous loans and still have outstanding dues and tuition costs, can I apply for a non certified loan? A:Firstly you should know the meaning of an uncertified loan, it is a loan that requires no approval from your schools education funding dept. it is used for extra expenses that come up such as accommodation etc. You can apply for non certified loans to cover your complete expenses, but it must be remembered that they are private loans. This means that their will be a high interest rate, strict repayment pans, cosigner will be required, and the lender will perform a strict credit check. Q:While going through the uncertified college loans plans, there was mention of the course on Organizational Behavior. What are the contents of this course? A:It is common to get to read about the course on Organizational Behavior while going through the Uncertified College Loans. This course is worth 2 credits in total. It is structured to provide students with ample understanding of the organizational setups and the ways in which the organizational behavior can affect the way in which an organization functions. Hands on experience is also provided. Q:As I read about the uncertified graduate school loans, there was mention of the course on Managerial Finance. What are the contents of this course? A:It is common to get to read about the course on Managerial Finance while going through the Uncertified Graduate School Loans. This course is worth 2 credits in total. It is designed to provide students with ample understanding of the thorough level examination of the theories of finance. Students are also highlighted on the concepts of financial environment of a firm with hands on experience. Q:As I read about the uncertified student loans lenders, there was mention of the course on Management Information Systems. What are the contents of this course? A:It is common to get to read about the course on Management Information Systems while going through the Uncertified Student Loans Lenders. This course is worth 2 credits in total. It is structured to provide students with substantial understanding of the ways in which businesses function. It highlights on how information systems function in a business setup. Q:My search on what is the certified private loan? took me to Facility Systems – Mechanical course. What is it about? A:It is common to come across the reference of various courses and programs you can take admission in with financial aid if you make search such as what is the certified private loan? Facility Systems – Mechanical course is a part of various programs related to the field. In it the students get to study about mechanical systems and their applications. Q:I came across ‘know before you owe’ program when searching for banks with uncertified student loans. What is the purpose of this program? A:There is a possibility of ‘know before you owe' coming up when searching for banks with uncertified student loans. This is an awareness program initiated by the CFPB as a means of informing students and parents about loans and their terms and conditions. It informs borrowers about different things that need to be considered when selecting a loan and what to look out for. Both students and parents vehemently recommended to make use of these services before applying for a loan. Q:Are there are any advantages of private uncertified student loans to certified student loans? A:Uncertified student loans provide funds when other sources of funding have expired. People are a little skeptical at times as regards to uncertified loans but you should know that they give greater flexibility in terms of the amount that can be borrowed as compared to certified loans. These loans also do not have to be validated by educational institutions. Q:If the amount received from FAFSA is not enough can I go for non certified Student Loans? A:In case you find that the financial support received from FAFSA is unable to assist you fully, you can always avail the non certified student loans option. Before taking up this option, check the financial liabilities and the interest rate as interest rates tend to be higher for such loans. It is recommended that you take the amount that you can easily pay back. Q:As I read about the uncertified student loan lenders, there was mention of the course on English Composition. What are the contents of this course? A:It is common to get to read about the course on English Composition while going through the Uncertified Student Loan Lenders. This course is usually of around 2 credits in total. It is designed to provide students with ample understanding of the basic skills of writing and all the different academic assignments. Hands on experience is also provided. Q:Tell me about non school certified student loans? A:I guess what you mean is non-certified student loans? Well non-certified student loans are loans which do not require certification for the academic institute you are enrolled in. These loans are offered by private lenders and have a very high interest rate. These loans are awarded directly to the student and not to the institute the student belongs to. Although these loans are given on the basis of financial need, a good credit history is still required. Q:If I want to get education loan not school certified, do I need to have good credit score? A:For education loans that are not school certified you need to have a credit score that the private lenders can approve of while providing the loan. As the loan is not given by schools or government, the basis of qualification for these loans is different. Private lenders do not want to take chances and risk their money therefore you must focus on building a good credit record. Q:What is the difference between non certified private student loans and certified loans? A:Federal loans are certified by the school before disbursing the funds to make sure that the money can only be used for the intended purposes. 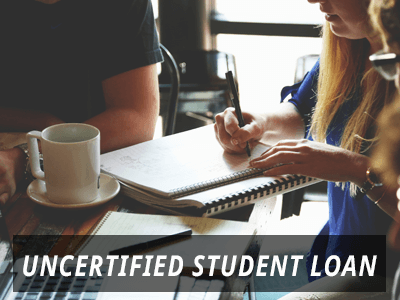 However, uncertified loans do not need to be certified by the school and students can use them for varying purposes like buying books or paying other expenses. Q:Should I opt for uncertified private student loans or should I apply for certified loans? A:Both loans, certified and uncertified have their own pros and cons. Your choice of loan should depend upon you need for finance, current situation, credit history, and eligibility. With uncertified student loans, you will have more freedom in controlling your expenditure. But these loans may carry a higher interest rate. On the other hand, certified loans are directly disbursed to your college, where they are allocated accordingly. Q:Should I go for non certified student loan because I do not think federal loans can meet my needs? A:Non certified student loan should be taken up if you have exhausted other sources. Private loans often come at high interest rates. Make sure that you compare the loans and terms that come along with it before settling for a private loan. Check the repayment options also and clarify if there is any confusion. Q:Can private uncertified student loans help me cover major educational expenses? A:Private uncertified student loans are disbursed to students directly. The student has complete freedom of deciding how to allocate these funds. With such loans, a number of educational expenses can be covered. These include tuition costs, travelling expenditures, books costs, and even boardroom costs. These loans are available from a number of private banking institutions.